Fairly priced, efficient and responsive to our calls. Weighed all of the options and was upfront about must-do versus nice-to-have fixes. I highly recommend their services. Nazzaro & Sons Plumbing & Heating is a full-service company active in the residential and commercial service markets. We offer repair and replacement plumbing services 24 hours a day, 7 days a week, with a genuine commitment to professional and personalized service. With proven plumbing service business experience, we have earned a stellar reputation as the top service company in the Chelmsford and Greater Lowell area! Our HVAC heating and cooling services, repairs and maintenance are second to none. Unlike larger companies in the area, our service technicians take the time to discuss your wants and needs as well as listen to what issues you may be having with your plumbing, heating or air conditioning unit. There are many things in life that you have to wait for; a plumber or HVAC repair technician in Chelmsford, Lowell and Billerica should not be one of them. When you need a plumber or HVAC tech, chances are it's an emergency. At Nazzaro & Sons Plumbing & Heating, we understand this. 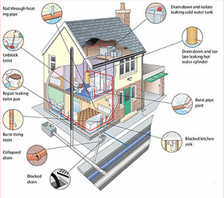 That is why we respond quickly, with a staff of highly skilled plumbing, heating and cooling professionals. Contact us today for emergency services or to schedule an appointment! The areas north of Boston are usually prone to colder, more snowy conditions than the rest of the state. As a result, your central heating system is working harder than most, which means it's also more prone to needing service and repairs. Our trained technicians are here to provide homeowners and businesses in the area with professional central heating system services and repairs so you can live and work in a comfortable environment this season. Our professional heating company is here to provide homeowners and businesses with new system installation services. If you've noticed that you're paying too much too often to get your existing heating system repaired, it's best to install a new, more energy efficient system. Our technicians are capable of installing any type of heating system, whether that be a hot water heater, gas or electric and our team is familiar with all current brands and models. Water heaters, heating systems, faucets, and leaky pipes . . . Whether you want to give your bathroom a facelift or add a luxury . . .